This lesson of Seven Pathways to Freedom is called Taking Action. So now I am looking and I am waiting to take action. I got nothing. However I do know that I have trouble with the big stuff. Little stuff is different. For example, I barely notice when I visualize my parking place because it has become second nature. I have a parking space for my regular shopping grounds. I never worry about parking because I know my space is there open and free for my taking. Another example. Two days ago my oldest daughter was saying she had just bought the game Hungry Hippos and told me how much Lexi was enjoying it. I am always on the look out for fun, entertaining pass times for Faith and Sidney. Hungry Hippos would be great for them. I want one. Today we were out "second hand" shopping. I don't usually look at the games because I have not had great luck when purchasing used games - pieces are usually missing. But today while I was waiting for Faith to finish up in the washroom, I wandered over to a near by section to browse and pass the time. I looked up, and there was Hungry Hippos. What a coincidence! I had to buy it. It cost three dollars. It is missing twelve marbles but that can be easily replaced. I just have to go to a dollar store. Faith and I played the game tonight with just eight marbles and we had fun. It is so nice to see her laughing like a crazy child. It was definitely worth the three dollars. I wonder if Hungry Hippos is a popular game stocked at second hand stores, as I said before I don't look in that department. Even so, it was kinda magical to look up and see it there staring at me, calling to me, buy me. I took action. I bought it. Since we are on the subject, I can think of many other occasions where I wanted something, visualized it and by some weird coincidence it appeared. Let me think. I like eating submarines. Yum.There is a vacant lot two blocks from work. I want a sub shop there so I can just walk over any time I want to treat myself with a sub for lunch. Well they have started construction in that vacant lot and guess what business is going in the strip mall? Yep. A sub shop. Yahoo! Thank you, thank you, thank you. I can't wait. And there's the friend that I haven't seen in a long time. i am thinking about her. Visualizing talking to her, laughing and having a grand time. The next weekend she drops by for a visit. When I say drops by, its not like she lives close by and my house is on her way to someplace else. She lives in a different city about thirty minutes away. Yes Sharon I am talking about you. By the way, we did do some side splitting laughing during that last visit and it was great seeing you. Maybe I am off topic here. My examples are more about lesson five - noticing the signs and coincidence. 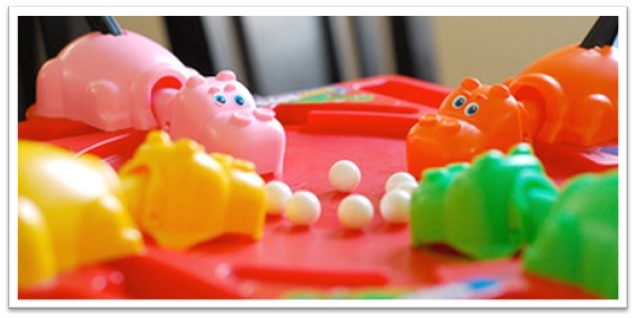 I did however did take action with the Hungry Hippos. I took the chance on a used game and even though it wasn't perfect, it was plenty good enough to give us a good time. Am I right? Taking action. Taking action. Help me here. I have taken action. I do take action. When I really want something and there are signs telling me I am doing the right thing. Because it does feel right and good. How else did I become HR Manager with no formal education in this field. I have credits towards an accounting designation not HR or Health and Safety. Although I have to toot my own horn to say I saw a need in a company that I worked for, and trained myself. I asked the right people for guidance and answers. I read everything I could on the topics and still do to keep current. I firmly believe that work experience can equal formal training and I am proof of it. What's that saying? By George I think she's got it! I hope I am not embarrassing myself by repeating a saying completely incorrectly like when someone sings a song and has all the lyrics wrong. I hope someone tells me if I did write it down wrong. Do you have any examples of "coincidences"? Or signs that called for you to take action in order for your visualization to become reality?